If you’re not familiar, STEM stands for Science, Technology, Math and Engineering. Ideally, a STEM lesson will encompass each of these disciplines, but even touching on only one or two will add a beneficial time of study to your homeschool day. 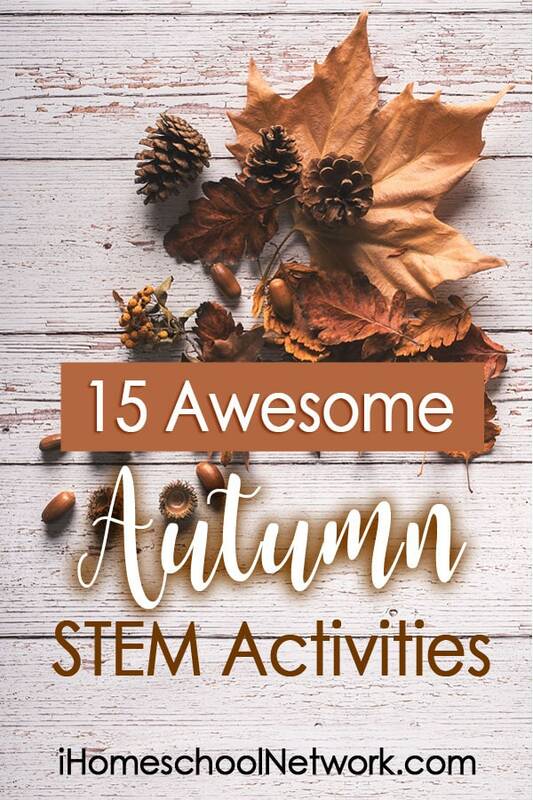 While I’m going to share some of my favorite Autumn STEM ideas, you may want to come up with your own ideas or plan out something that more specifically fits your family’s interests. I’ve organized this post into 3 different Fall STEM categories: leaves, apples and pumpkins. So if you’re looking for something specifically related to one of these Fall favorites, check out the list below! Go On a Leaf Hunt – This is a super simple way to get started, and this post includes lots of ideas for ways to learn about and compare the leaves you find. Changing Leaves Discovery Table – Put all of your fun finds together with some fun Fall books and let your kids play and explore. Why Do Leaves Change Color? – simple, hands on experiment to help kids learn about the changing leaves. Why Do Pine Cones Open? – Another super simple experiment to teach kids about pine cones. Literature Based Math & Science – Explore the trees in your own backyard along with some adorable children’s books. Numbers to 10 Leaf Hunt – Practice counting and learning about leaves with this simple activity. Slicing Apples Math Activity – help kids understand how to compose and decompose numbers with apples and number bonds with this simple activity (free printable pages included). Erupting Apples – This is a science activity your kids will love-make an erupting apple volcano! Building Apple Structures – This post has lots of fun ideas for ways to build and learn with apples. Exploring the Five Senses with Apples – This is another really simple way to explore (free printable included). Why Do Apples Turn Brown? – Test out a variety of ideas for keeping apples from turning brown (and learn about the scientific method in the process). How Many Seeds In a Pumpkin? – This fun experiment will teach kids math and estimation skills, as well as learning about pumpkins. How Much Does a Pumpkin Cost? – This 3 part lesson is geared toward older students and helps make connections to important Algebra concepts (free printable included). Pumpkin Volcano – Here’s another fun twist on a hands on volcano, this time with a pumpkin! Create a Pumpkin Geoboard – Explore lots of math ideas with a DIY geoboard using a pumpkin. Observe a Rotting Pumpkin – How does a pumpkin change as it rots? Kids will love the “gross” factor of this long-term project. Or if you’re looking for even more pumpkin math, check out the ultimate collection of pumpkin math ideas, organized by age/grade. Do you enjoy Fall themed learning? What are some of your favorite STEM activities to try out in Autumn? Bethany is a former math teacher and the mom behind the blog, MathGeekMama.com. Her passion is to help excite, encourage and challenge kids to love math by helping parents and teachers teach in a way that makes sense.